Vegans – are they going too far? Probably, but we aren’t allowed to say anything about it because it might hurt their feelings and they’ll throw stuff at us. It is getting a bit out of hand though, isn’t it? I mean, I love animals, and I’m all for people believing what they believe in but… some people out there just take it way, waaaay too far. 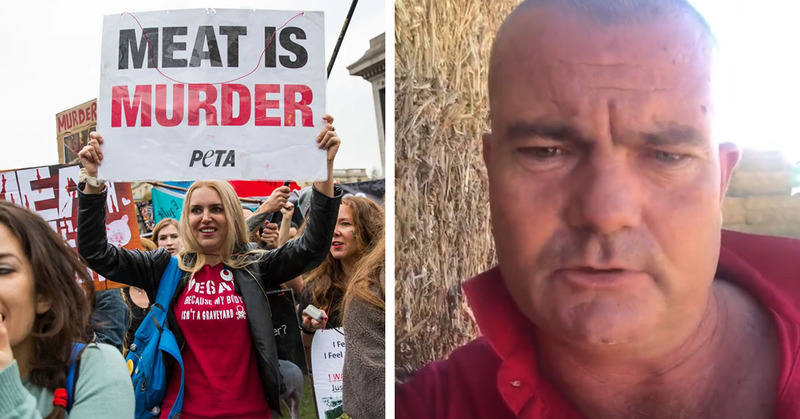 And somebody who learned this the hard way recently is this incredibly angry Australian grazier – a grazier is someone who rears cows, just FYI – and he is 100% sick of their cr*p.
So much so, that he has now gone viral hitting out against vegan protestors in a bizarre (yet hilarious) rant during which he claims that one activist actually had the audacity to tell him that lettuce, does, in fact, have a heartbeat. Brendan Farrell – aka the angry farm grazier – runs a charity named ‘the Burrumbuttock Hay Runners charity’. His charities main aim is to bring extra hay to farmers during extreme times of drought. Despite all the incredible work he does for the community, Farrell says that he has received a plethora of angry phone calls from vegans who completely disagree with not only his job but also his way of life. During the strange video, Farrell attacked the recent protests that have been taking place as abattoirs all across New South Wales and Queensland, as well as all the protestors who chained themselves to vehicles in Melbourne’s Central Business District this passing Monday.